Rittenhouse is Ready for You! 3 Beds 1 / 1 Bath 1 Partial Bath 1,554 Sq. ft.
District COLUMBUS CSD 2503 FRA CO. Description: Open sunday, 9/30,1-3! 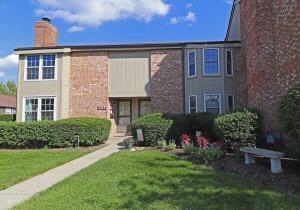 Picture perfect condo, close to bethel & henderson, shopping, restaurants & business centers. This attractive, well maintained home has an open floor plan with all the space & style you've been looking for. Features include new hvac, plush carpet, living room with bay window, dining room with sliding glass door to the patio & efficient kitchen with pass through breakfast bar counter. 3 upper level brs including the owner's ste with bay window, 2 walk-in closets & door to the 2-room full bath with 2 separate vanities & tub/shower. Huge full basement with laundry area & sink. The outdoor living area is enhanced by a privacy enclosed patio with gate to the carport. Beautifully landscaped community has a clubhouse with fitness center & 2 pools. Just move in and enjoy!